Many bodybuilders and regular gym goers feel that leg extensions are one of the best quad exercises you can do. But heavy knee extensions are not without some controversy. Let's first talk about how to do the exercise, and then we'll talk about why some physical therapist don't recommend it for people with certain knee problems. Almost every gym has a knee extension machine that isolates the quads (which are the muscles on the front of the thigh). Because the quads are isolated, you can get focused work on this muscle group. 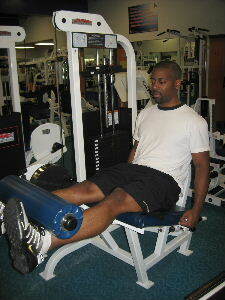 Below is a picture of a knee extension leg machine. Starting Position: Begin by sitting comfortably in the machine and adjust the seat so that your knee lines up with the pivot point on the machine. Then, adjust the leg pad, so that it is comfortable on the lower shin. Form: Exhale and extend your legs until they are straight. Hold for a brief second and then slowly lower to the starting position. Personal Trainer Tips: Move in a slow and controlled manner. If you feel pain in your knees during this exercise, stop and consult with a licensed health professional. Why Leg Extensions are Controversial!? First of all it is important to know that every exercise places stress on the body. When constructing fitness programs or workout routines, you always want to think about risk versus benefit. When compared to a traditional squat, the knee extension machine can place even more stress on the patellar tendon, knee ligaments (ACL), and cartilage behind the patella. In some instances, therapists might use the knee extension machine to correct muscles imbalances and increase the strength of the quads. For some people the risk of hurting the knees is higher than the benefit of doing this exercise. The leg extension can definitely tone the quads or help someone to build up their quad muscles, but if you have pain during or after this exercise it might mean that you should take it out of your leg workout. The Knee Extension is Not Functional! Another reason the knee extension is not recommended by some physical therapists and personal trainers is that it doesn't improve the functions of running and jumping as efficiently as squats or lunges. Functional training says that if you simulate the task you want to improve, you will get better faster results. If you look at walking, climbing, hiking, jogging, squatting, or jumping you'll notice that the knee never moves like it does on the knee extension machine. If you want to improve walking, running, or jumping, you will get more improvement if you include exercises like squats, lunges, or the leg press machine. 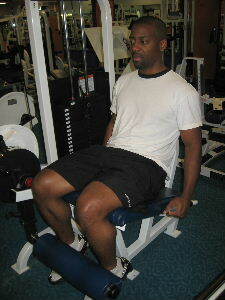 Some people like the knee extension machine, but I would say to use it with caution during your leg workouts. If you have knee pain consult with a licensed health professional. There are many different leg exercises to that you can include in your workout to work the quads, like lunges, squats, step ups, or the leg press machine. Listen to your body, and seek professional consultation when needed.